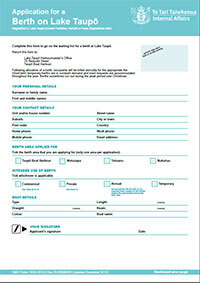 Anyone who wants to go on the waiting list for a berth at Lake Taupō needs to complete the following application form and return it to the Harbourmaster’s Office. Short-term temporary berths are in constant demand, and most requests are accommodated throughout the year. Berths often run out during the peak period over Christmas/New Year.